Art for therapy isn’t a new concept – it’s been used for decades to help people examine psychological and emotional issues in a way that feels safe, organic and natural. Because things like drawing, painting, collage and colouring are repetitive and creative by nature, they allow us to work at something on a simple level that employs both our hands and brains, while allowing our subconscious mind space to roam freely. When someone has the space to work artistically, to create shapes and colour without form or reason, they become more able to examine the undertones in their art, and start to understand some of the way they feel. But, perhaps more importantly, is the simple act of creation itself, of making something tangible that you can hold in your hand or hang on your wall that feels so transformative. 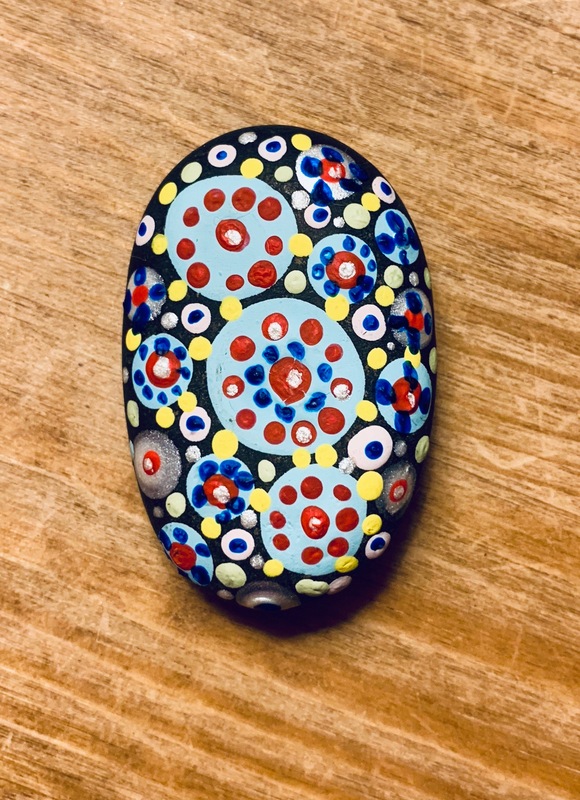 Last year, I did a creative art therapy course, organised through a local charity here, which opened a world of creativity to me that felt almost life-changing. Not least because it brought people together who were experiencing the same things. And it’s a very rare, and clever thing, to be able to get people talking, who might not ordinarily have felt like saying a word about how they were feeling to anyone. Depression and anxiety can be beyond debilitating for some people (and I feel very lucky that I have not suffered as much as some), and even though you know that it is not your fault and is in reality just that the wiring in your brain has gone a bit wonky, it doesn’t stop you feeling like you’ve let everyone down, and wishing that you’d been able to cope better. Coming together for a purpose is a really important thing for people whose days often feel entirely purposeless, and having something practical or creative to channel your feelings into is a great way to break down walls. It’s also a great way to get people talking without realising they’re even doing it. Every week we came together to make things like batik pictures, mosaics or hand-painted pottery – but most importantly, we talked. And I mean, really talked. No off-limits topic, no awkwardness, no shocked faces. Just understanding and empathy. Distracted by the paintbrush or needle in our hands, not needing to make eye-contact, welcome to sit back and absorb the conversation or to contribute to it while you worked, the weekly sessions became the focus of my week. No babies, no distractions, time to think, to create, to focus, to be heard. It’s been healing in so many ways and I’ve learnt an awful lot, not least things I can do at home to channel some of that creative energy when it all gets too much. Below are three of the most special skills or crafts I’ve picked up. 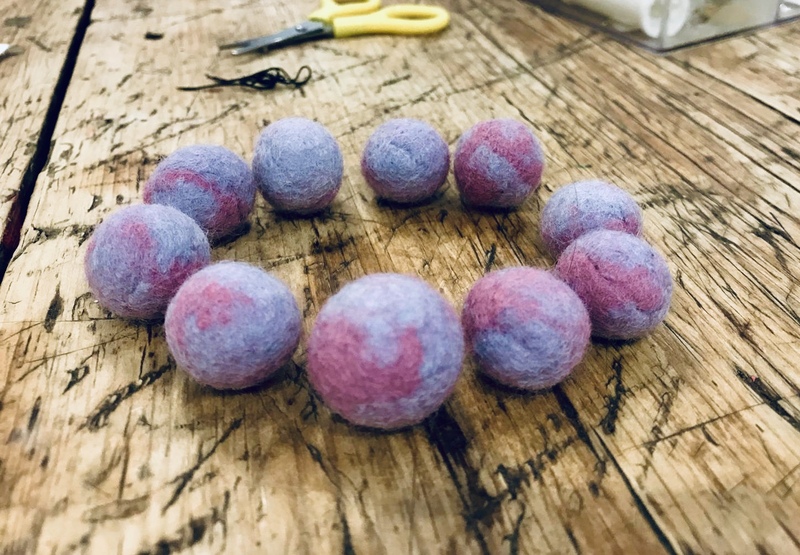 Wet Felting: This is such a simple easy craft, that requires gentle, slow movements, soft hands, quietness – simply pulling apart balls of soft felting wool, forming them into little spheres, wetting them with warm water and slowly moving the balls from hand to hand, twisting your hands around, as they get smaller and smaller and more compact, before eventually forming a hard, nut-sized shape. We turned ours into acorns, topped them with acorn caps and then hung them around the house. I even made one to attach to my car keys so I can see it every day. You can make all sorts of things, including pictures and scarves with wet felt, more details here. Slow Stitching: Despite totally loathing anything to do with sewing, I adored this session, in part because of how beautifully the artist working with us that week explained slow or mindful stitching, and also because of what an amazing metaphor it is for life. 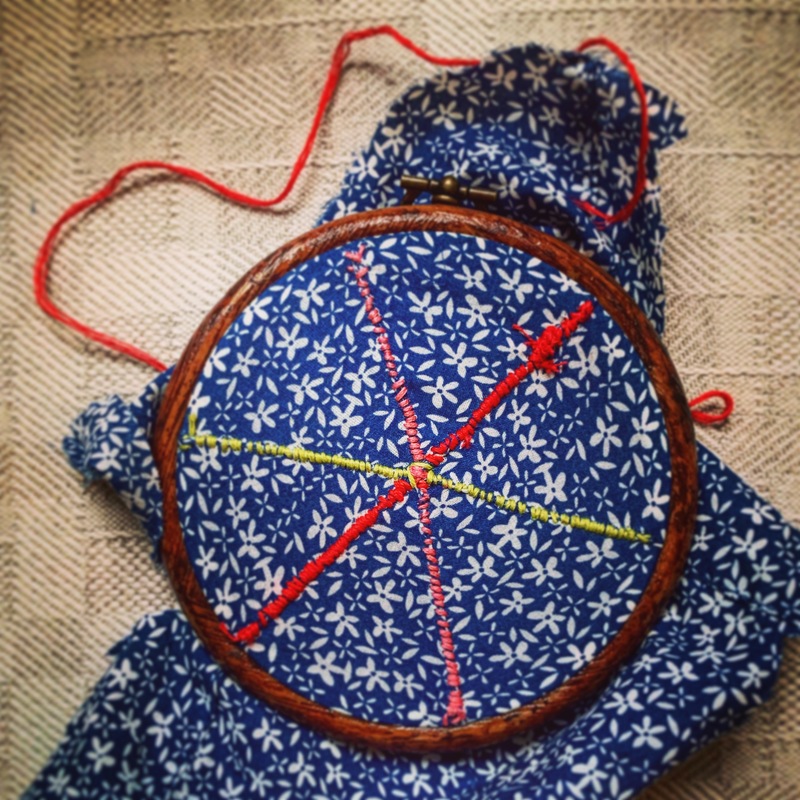 Slow stitching is about finding beauty and acceptance in simplicity, and about going with the flow. When you sew in this way you just start somewhere on a piece of fabric and go wherever your needle takes you. It’s not at all about precision or neatness or following lines. It is about the act of creation, and not the finished product, the beauty and simplicity of making and doing. 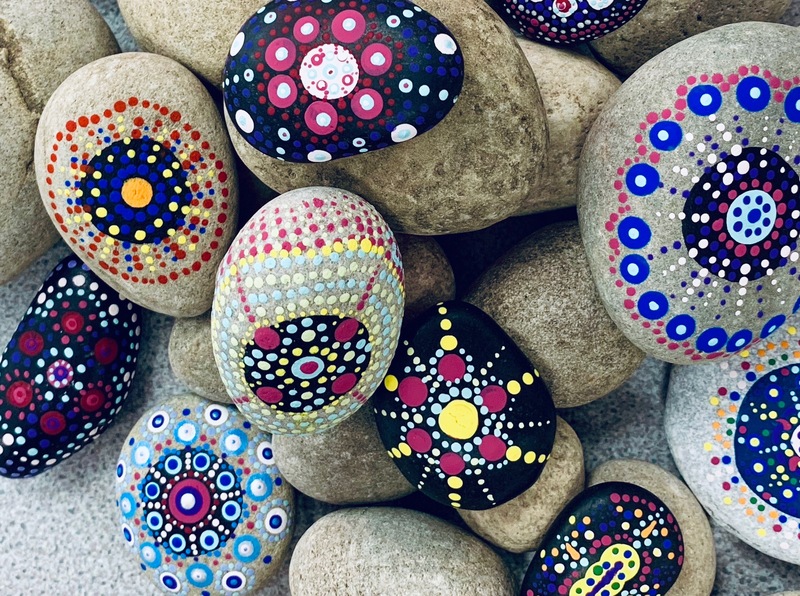 Mandala Stone Painting: There is something incredibly therapeutic about mandala stone painting, which is all about repetitive, continual circles, moving out from the centre, using colour in any way you choose, putting layer upon layer. Mandala comes from the Sanskrit word for circle, which refers to a sense of wholeness created by circular, concentric forms. “The idea of creating a mandala represents transformation of the universe from a reality of suffering, to possibly one of enlightenment.” The focus on the circular patterns is almost meditative and hypnotic. And, you can’t go wrong, you can’t make a mistake, you just keep dotting different sized dots of colour onto the smooth, cool surface. At the end, the dried paint feels textured and warm in your hands, while the heavy, cool weight of the stone is comforting. We wrote meaningful words on the bottom of our stones, and I have them dotted around the house as a soothing reminder. It was hard at times to commit the two hours every week to doing this course. I had to rely in family to have the children and it took time for me to not to feel guilty about that. But, over time, I realised that it was actually a powerful act of self care and self respect to insist that I kept on going and didn’t miss a class. Accepting that, and putting myself first sometimes, is really important, and has been a major step forward. I am now fiercely protective of the time that I set aside just for me. 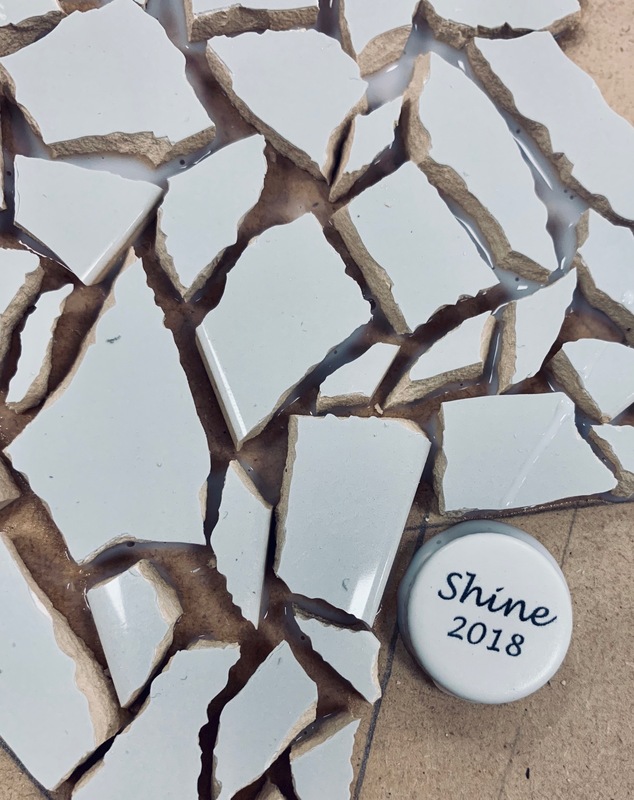 For more info on Shine, click here. Next Post The Important Thing About Valentine’s Day….